If we are all being honest with each other – which I hope we are – we all struggle and have pictures stored on our phone or computers that still need to be printed! I myself have countless of pictures, candids and otherwise, that are just sitting in the digital maze on my external hard drive. But hopefully, this post not only motivates you to go print your prints, but gives you some ideas on how to choose the best wall art and where to display it. But first let me explain my new process of crafting the perfect products from your sessions so you understand that every step of the way, I am hoping to give you exactly what you want. From the very first point of contact, I sit down with potential clients for a sit-down preconsultation meeting usually at my studio in Ashburn. Not only are these meetings great so that we can meet and you can see how much of a weirdo I am (but a professional weirdo ), I also get to hear your questions you may have and your ultimate goal from your session whether announcements, album, or art for their walls. 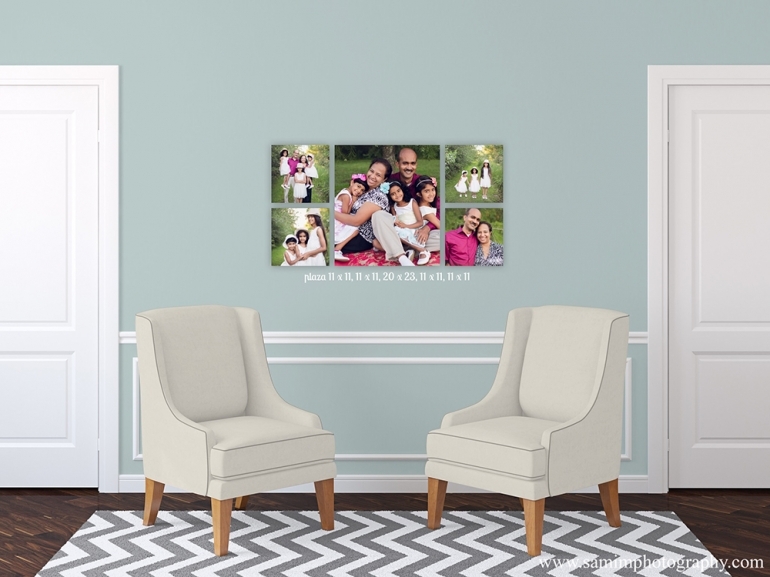 Recently, so many clients have asked about finally getting those photos to hang on their walls in various places – living rooms, dining rooms, a sitting area, the baby’s nursery above the crib, or even above their own beds. Hearing that – man does it make my heart go pitter-patter! At these preconsultations, we also discuss outfits, session location, potential wall art location, and wall color. During your session, I am thinking of poses that I think will look great with the information you provided. I am visually creating a cohesive collection that will make your selection much more varied! I also aim to capture not only those formal poses – you know the ones that grandma is going to want printed for her refrigerator – but also the snuggly, lovey pictures of your little family or you and your significant other! At your selection appointment after I finish editing your photos, we sit down and go through your gallery image by image. If you want my input, I will sit with you and discuss what I like visually from each and every proof. Together we can go through and narrow down your images from the 20-40 presented images to 10-15, sometimes more depending on your preferred product choice. I then load your selected images into this amazing app that creates completely customizable wall displays. There are a vast amount of stock backgrounds to choose from but I can even take a photo with my iPad (or you provide an image) and we can actually see what your desired space will look like! Here is an example of a canvas collection from a recent client purchase with the actual nursery pictured! In this design mock-up below, three black and white canvas display above the bed is just perfect. The intimate nature of this maternity session, the closeness of the two subjects, the color schemes, everything makes this such a perfect grouping for this space. Product sizes featured: 10×20, 20×30, and 10×20. These custom sizes are not your average 5×7 or 8×10 prints. In fact, they are much larger and your eyes almost goes directly to that display which is exactly what you want! For this display area, I would probably use family or children portraits especially because it may be a high traffic area in the house. When there are just way too many pictures to choose from, a collage is such a simple solution. There is no limit on the number of photos in your collage! Another potential high traffic area with children portraits. Cohesive colors and poses in all three photos. These can be easily added to with the potential of three more similar sized portraits above or one large panorama image above. 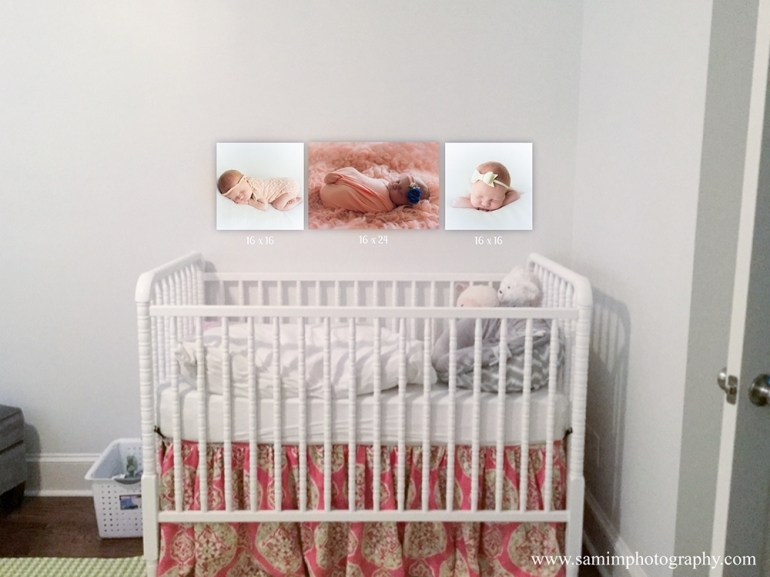 Another example of a bedroom display but this time with newborn parent images. This would also be a great before & after display with a maternity photo being the first image and the newborn image as your second. What better place to display those gorgeous newborn photos than above their little crib or changing table? This wall display becomes especially poignant when you put down your little one-year-old to bed and you can actually see how your little baby is not longer so little anymore! Although still symmetrical in thought, your display does not have to always be even-steven! No matter your session choice, wall display location, or number of images you choose, I am there to help you create a dynamic display that is definitely going to be “oohed” & “ahhed” by whoever sees it! Also, if you are interested in getting free tips, blog posts sent directly to your email, and emails about early bird specials ****i.e. fall session dates available**** than you definitely want to fill out the form below!